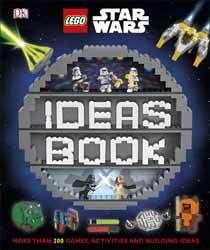 For LEGO Star Wars fans out there, DK's new Ideas Book is pretty much an essential purchase. At just over 200 pages, there's plenty of cool projects to tackle. From developing your own droids, to constructing landscape scenes, to building your own larger LEGO Star Wars figures, this book offers many ideas that can be used to inspire you to create your own designs. It takes some of the LEGO Star Wars kits that you will no doubt have in your collection and while it doesn't offer step-by-step instructions to follow, there are plenty of images that are designed to inspire everyone from the novice to expert builder. There's also a fun section called 'Challenge' that outlines games and activities you can make, from 'Knock Down Stormtrooper Skittles' to 'Pick Up Lightsaber Sticks'. The design is impressive, with plenty of large detailed photos of the suggested projects. This can be used as a jumping off point to fuel your own creativity. This is the perfect book to bring the whole family together for fun family activities. Obviously if you only buy LEGO Star Wars kits to display the finished model then you probably won't want to tear them apart in order to build your own models, but for those that enjoy the creative side of designing their own projects there's a lot of ideas here.